To begin, let’s be clear that an Azure Cosmos DB container can have only one partition key. I say this from the start in case “multiple partition keys” in the title is somehow misinterpreted to imply otherwise. You always need to come up with a single property to serve as the partition key for every container and choosing the best property for this can sometimes be difficult. Making the right choice requires intimate knowledge about the data access patterns of your users and applications. You also need to understand how horizontal partitioning works behind the scenes in terms of storage and throughput, how queries and stored procedures are scoped by partition key, and the performance implications of running cross-partition queries and fan-out queries. So there are many considerations to take into account before settling on the one property to partition a container on. I discuss all this at length in a previous blog post Horizontal Partitioning in Azure Cosmos DB. But here’s the rub. What if, after all the analysis, you come to realize that you simply cannot settle on a single property that serves as an ideal partition key for all scenarios? Let’s say for example, from a write perspective, you find one property will best distribute writes uniformly across all the partitions in the container. But from a query perspective, you find that using the same partition key results in too much fanning out. Or, you might identify two categories of common queries, where it’s roughly 50/50; meaning, about half of all the queries are of one type, and half are of the other. What do you do if the two query categories would each benefit from different partition keys? Your brain can get caught in an infinite loop over this until you wind up in that state of “analysis paralysis,” where you recognize that there’s just no single best property to choose as the partition key. To break free, you need to think outside the box. Or, let’s say, think outside the container. Because the solution here is to simply create another container that’s a complete “replica” of the first. This second container holds the exact same set of documents as the first but defines a different partition key. I placed quotes around the word “replica” because this second container is not technically a replica in the true Cosmos DB sense of the word (where, internally, Cosmos DB automatically maintains replicas of the physical partitions in every container). Rather, it’s a manual replica that you maintain yourself. Thus, it’s your job to keep it in sync with changes when they happen in the first container, which is partitioned by a property that’s optimized for writes. As those writes occur in real time, you need to respond by updating the second collection, which is partitioned by a property that’s optimized for queries. Let’s get started. Assume that we’ve done our analysis and established that city is the ideal partition key for writes, as well as roughly half of the most common queries our users will be running. But we’ve also determined that state is the ideal partition key for the other (roughly half) commonly executed queries. This means we’ll want one container partitioned by city, and another partitioned by state. 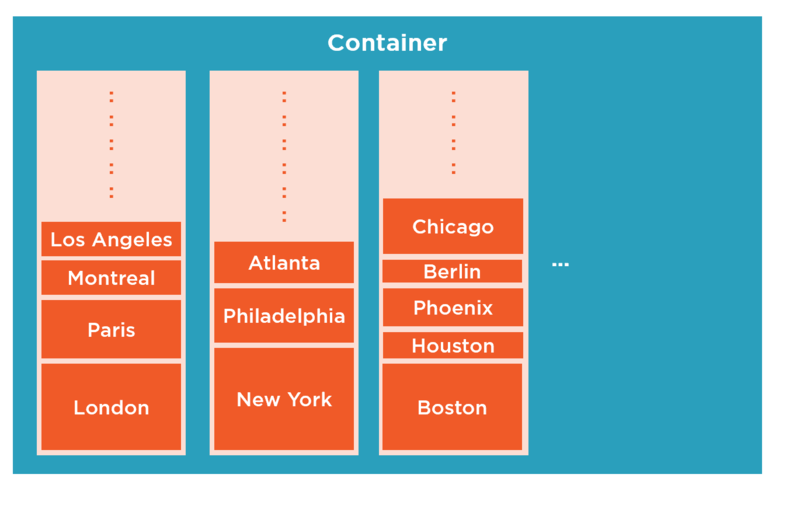 And we’ll want to consume the city-partitioned container’s change feed to keep the state-partitioned container in sync with changes as they occur. We’ll then be able to direct our city-based queries to the first container, and our state-based queries to the second container, which then eliminates fan-out queries in both cases. If you’d like to follow along, you’ll need to be sure your environment is setup properly. First, of course, you’ll need to have a Cosmos DB account. The good news here is that you can get a free 30-day account with the “try cosmos” offering, which doesn’t even require a credit card or Azure subscription (just a free Microsoft account). Even better, there’s no limit to the number of times you can start a new 30-day trial. Create your free account at http://azure.microsoft.com/try/cosmosdb. You’ll need your account’s endpoint URI and master key to connect to Cosmos DB from C#. 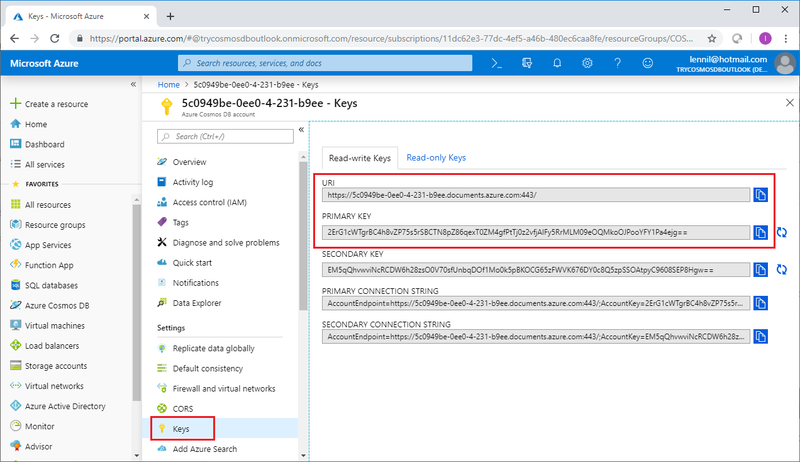 To obtain them, head over to your Cosmos DB account in the Azure portal, open the Keys blade, and keep it open so that you can handily copy/paste them into the project. You’ll also need Visual Studio. I’ll be using Visual Studio 2019, but the latest version of Visual Studio 2017 is fine as well. 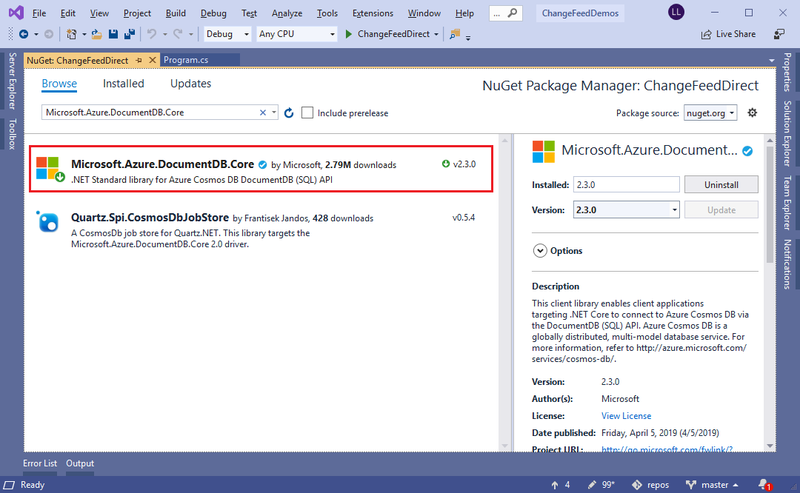 You can download the free community edition at https://visualstudio.microsoft.com/downloads. We’ll begin with the raw approach, which is to query the change feed directly using the SDK. The reality is that you’ll almost never want to go this route, except for the simplest small-scale scenarios. Still, it’s worth taking some time to examine this approach first, as I think you’ll benefit from learning how the change feed operates at a low level, and it will enhance your appreciation of the Change Feed Processor (CFP) library which I’ll cover in the next blog post of this series. We’ll write some basic code to create a database with the two containers, with additional methods to create, update, and delete documents in the first container (partitioned by city). Then we’ll write our “sync” method that directly queries the change feed on the first container, in order to update the second container (partitioned by state) and reflect all the changes made. Note: Our code (and the SDK) refers to containers as collections. Most of this code is intuitive, even if you’ve never done any Cosmos DB programming before. We first use our endpoint and master key to create a DocumentClient, and then we use the client to create a database named multipk with the two containers in it. This works by first calling DeleteDatabaseAsync wrapped in a try block with an empty catch block. This effectively results in “delete if exists” behavior to ensure that the multipk database does not exist when we call CreateDatabaseAsync to create it. Next, we call CreateDocumentCollection twice to create the two containers (again, a collection is a container). We name the first container byCity and assign it a partition key of /city, and we name the second container byState and assign /state as the partition key. Both containers reserve 400 request units (RUs) per second, which is the lowest throughput you can provision. Notice the DefaultTimeToLive = -1 option applied to the first container. At the time of this writing, change feed does not support deletes. That is, if you delete a document from a container, it does not get picked up by the change feed. This may be supported in the future, but for now, the TTL (time to live) feature provides a very simple way to cope with deletions. Rather than physically deleting documents from the first container, we’ll just update them with a TTL of 60 seconds. That gives us 60 seconds to detect the update in the change feed, so that we can physically delete the corresponding document in the second container. Then, 60 seconds later, Cosmos DB will automatically physically delete the document from the first container by virtue of its TTL setting. You’ll see all this work in a moment when we run the code. The other point to call out is the creation of our sync document, which is a special metadata document that won’t get copied over to the second container. Instead, we’ll use it to persist a timestamp to keep track of the last time we synchronized the containers. This way, each time we sync, we can request the correct point in time from which to consume changes that have occurred since the previous sync. The document is initialized with a lastSync value of null so that our first sync will consume the change feed from the beginning of time. Then lastSync is updated so that the next sync picks up precisely where the first one left off. Notice that all three documents have city and state properties, where the city property is the partition key for the container that we’re creating these documents in. The state property is the partition key for the second container, where our sync method will create copies of these documents as it picks them up from the change feed. The slogan property is just an ordinary document property. And although we aren’t explicitly supplying an id property, the SDK will automatically generate one for each document with a GUID as the id value. This code retrieves the Brooklyn document, updates the slogan property, and calls ReplaceDocumentAsync to persist the change back to the container. Remember that (currently) the change feed doesn’t capture deleted documents, so we’re using the TTL (time to live) technique to keep our deletions in sync. Rather than calling DeleteDocumentAsync to physically delete the Orlando document, we’re simply updating it with a ttl property set to 60 and saving it back to the container with ReplaceDocumentAsync. To the change feed, this is just another update, so our sync method will pick it up normally as you’ll see in a moment. Meanwhile, Cosmos DB will physically delete the Orlando document from the first container in 60 seconds, giving our sync method up to one minute to pick it up from the change feed and delete it from the second container. Let’s break this down. First, we grab the last sync time from the sync document in the first container. Remember, this will be null the very first time we run this method. Then, we’re ready to query the change feed, which is a two-step process. For step 1, we need to discover all the partition key ranges in the container. A partition key range is essentially a set of partition keys. In our small demo, where we have only one document each across three distinct partition keys (cities), Cosmos DB will host all three of these documents inside a single partition key range. Although there is conceptually only one change feed per container, there is actually one change feed for each partition key range in the container. So step 1 calls ReadPartitionKeyRangeFeedAsync to discover the partition key ranges, with a loop that utilizes a continuation token from the response so that we retrieve all of the partition key ranges into a list. Then, in step 2, we iterate the list to consume the change feed on each partition key range. Notice the ChangeFeedOptions object that we set on each iteration, which identifies the partition key range in PartitionKeyRangeId, and then sets either StartFromBeginning or StartTime, depending on whether lastSync is null or not. If it’s null (which will be true only on the very first sync), then StartFromBeginning will be set to true and StartTime will be set to null. Otherwise, StartFromBeginning gets set to false, and StartTime gets set to the timestamp from the last sync. After preparing the options, we call CreateDocumentChangeFeedQuery that returns an iterator. As long as the iterator’s HasMoreResults property is true, we call ExecuteNextAsync on it to fetch the next set of results from the change feed. And here, ultimately, is where we plug in our sync logic. For all other changed documents, it now becomes a matter of performing the appropriate create, update, or delete operation on the second container. First, we check to see if there is a ttl property on the document. Remember that this is our indication of whether this is a delete or not. If the ttl property isn’t present, then it’s either a create or an update. In either case, we handle the change by calling UpsertDocumentAsync on the second container (upsert means “update or insert”). Otherwise, if we detect the ttl property, then we call DeleteDocumentAsync to delete the document from the second container, knowing that Cosmos DB will delete its counterpart from the first container when the ttl expires. Both containers are now in sync. Refresh the first container view, and you’ll see that the lastSync property has been changed from null to a timestamp from when the previous sync ran. Refresh the second container view, and you’ll see that the slogan property has now been updated there as well. You can now confirm that the Orlando, FL document is deleted from the second container, and within a minute (upon ttl expiration), you’ll see that it gets deleted from the first container as well. However, don’t wait longer than a minute after setting the ttl before running the sync or you will run out of time. Cosmos DB will delete the document from the first container when the ttl expires, at which point it will disappear from the change feed and you will lose your chance to delete it from the second container. It didn’t take that much effort to consume the change feed, but that’s only because we have a tiny container with just a handful of changes, and we’re manually invoking each sync. To consume the change feed at scale, much more work needs to be done. For example, the change feed on each partition key range of the container can be consumed concurrently, so we could add multithreading logic to parallelize those queries. Long change feeds can also be consumed in chunks, using continuation tokens that we could persist as a “lease,” so that new clients can resume consumption where previous clients left off. We also want the sync automated, so that we don’t need to poll manually. Fortunately, the Change Feed Processor (CFP) library handles all these details for you. It was certainly beneficial to start by querying the change feed directly, since exploring that option first is a great way to learn how change feed works internally. However, unless you have very custom requirements, the CFP library is the way to go. So stay tuned for part 2, and we’ll see how much easier it is to implement our multiple partition key solution much more robustly using the CFP library. In Azure Cosmos DB, partitioning is what allows you to massively scale your database, not just in terms of storage but also throughput. You simply create a container in your database, and let Cosmos DB partition the data you store in that container, to manage its growth. This means that you just work with the one container as a single logical resource where you store data. And you can just let the container grow and grow, without worrying about scale, because Cosmos DB creates as many partitions as needed behind the scenes to accommodate your data. These partitions themselves are the physical storage for the data in your container. 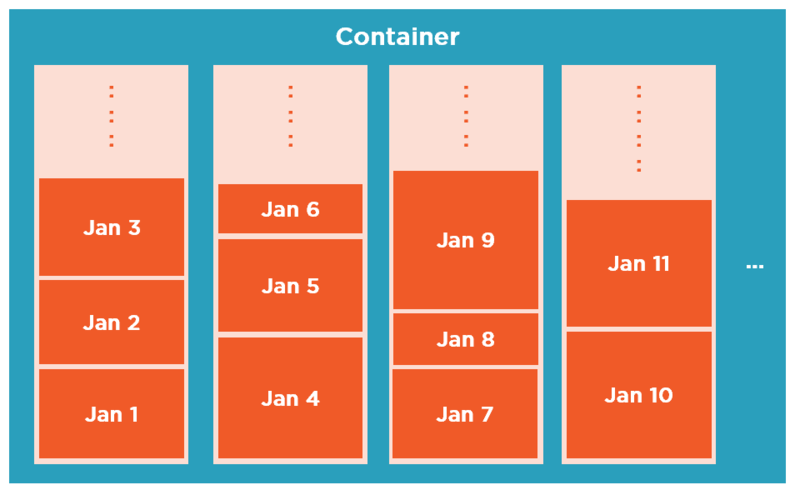 Think of partitions as individual buckets of data that, collectively, is the container. But you don’t need to think about it too much, because the whole idea is that it all just works automatically and transparently. So when one partition gets too full, Cosmos DB automatically creates a new partition, and frees up space in the growing partition by splitting its data, and moving some of it over into the new partition. 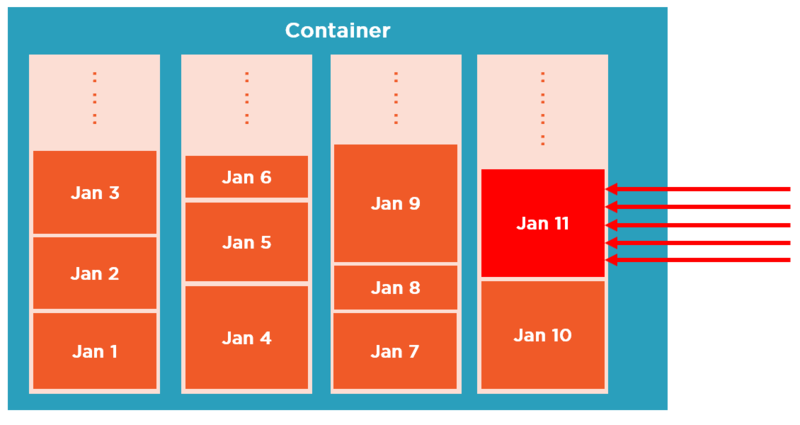 This technique scales the storage of your container, but the partitions themselves are also replicated internally, and so this also ensures availability of your container. Furthermore, Cosmos DB will split partitions even well before they grow too full, which also scales throughput because there are now more partitions available to satisfy a larger workload. But the question then becomes, how does Cosmos DB know which data is stored in which partitions? I mean, if your container grows to hundreds or thousands of partitions, how does Cosmos DB know where to look for data when you run a query? Having a piece of data stored arbitrarily in any given partition within the collection means that Cosmos DB needs to check each individual partition when you query. This doesn’t seem very efficient, which is why Cosmos DB can be much smarter about this, and that’s where you come in. Because your job in all of this – and really your only job – is to define a partition key for the container. The single most important thing you need to do when you create a container is to define its partition key. This could be any property in your data, but choosing the best property will scale your data for storage and throughput in the most efficient way. And conversely, some properties will be a poor choice, and will thus impede your ability to scale. So even though you don’t need to handle partitioning yourself, understanding how Cosmos DB internally partitions your data, combined with an understanding of how your data will be most typically accessed, will help you make the right choice. For each item you write to the container, Cosmos DB calculates a hash on the property value that you’ve designated as the partition key, and it uses that hash to determine which physical partition the item should be stored in. This means that all the items in your container with the same value for the property you’ve chosen for the partition key will always be stored physically together in the same partition, guaranteed. They will never, ever, be spread across multiple partitions. However, this certainly does not mean that Cosmos DB creates one partition for each unique partition key value. Your container can grow elastically, but the partitions themselves have a fixed storage capacity. So one physical partition per partition key (i.e., logical partition) is far from ideal, because you’d potentially wind up having Cosmos DB create far more partitions than are actually necessary, each with a large amount of free space that will never be used. But as I said, Cosmos DB is much smarter than that, because it also uses a range algorithm to co-locate multiple partition keys within a single partition. This is totally transparent to you however – your data gets partitioned by the partition key that you choose, but then which physical partition is used to store an item, and what other partition keys (logical partitions) happen to be co-located on that same partition – well that’s all insignificant and irrelevant as far as we’re concerned. So now you understand that all the items with the same partition key will always live together in the same partition, which makes it easier to figure out what property in your data might or might not be a good candidate to use for the partition key. First, queries will be most efficient if they can be serviced by looking at one partition, as opposed to spreading the query to work across multiple partitions. That’s why, typically, you always want to supply the partition key value with any query you want to run, so that Cosmos DB can go directly to the partition where it knows all the data that could possibly be returned by your query lives. You can certainly override this, and tell Cosmos DB to query across all the partitions in your collection, but you would definitely want to pick a partition key where such a query would be the exception, rather than the general rule, which would be that most typical queries in your application (say 80% or more) could be scoped to a single partition key value. The same is true of updates, because – as I’ll blog about soon – you can write server-side stored procedures that update multiple documents in a single transaction, so that all the updates succeed or fail together as a whole, and this is possible only across multiple documents that have the same partition key value, which is another thing to think about when defining the partition key for a container. You also want to choose a value that won’t introduce bottlenecks for storage or throughput. Something that can be somewhat uniformly distributed across partitions, so that storage and throughput can be somewhat evenly spread within the container. Like I’ve been explaining, all the items for any city are stored together within the same partition, and each partition is co-locating multiple partition keys. 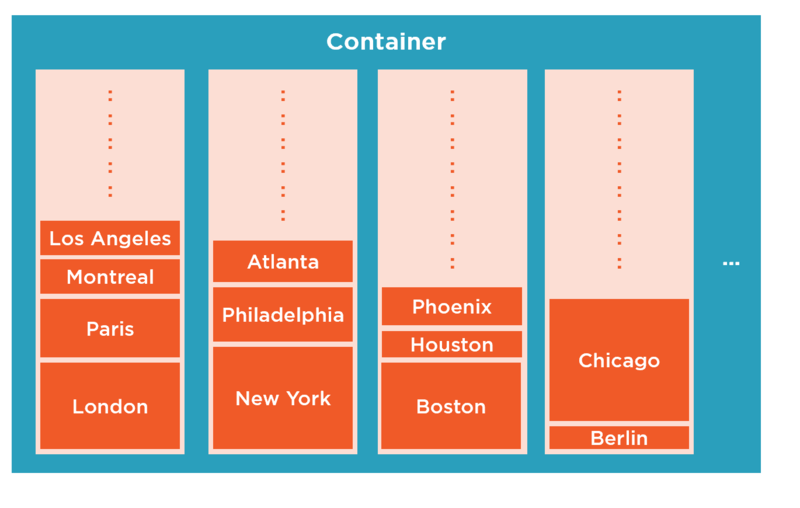 It’s not a perfect distribution – and it never will be – but at least at this point, it seems we can somewhat evenly distribute our data within the container using city as the partition key. Furthermore, any query within a given city can be serviced by a single partition, and multiple items in the same city can be updated in a single transaction using a stored procedure. But is city still the best choice to use here? If you have a few cities that are significantly larger than others, or that are queried significantly more often than others, then perhaps a finer granularity might be better, like zip code, for example. That will yield many more distinct values than city, and ideally, you want a partition key with many distinct values – like hundreds or thousands, at a minimum. Ultimately, only you will be able to make the best choice, because the best choice will be driven by the typical data access patterns in your particular application. 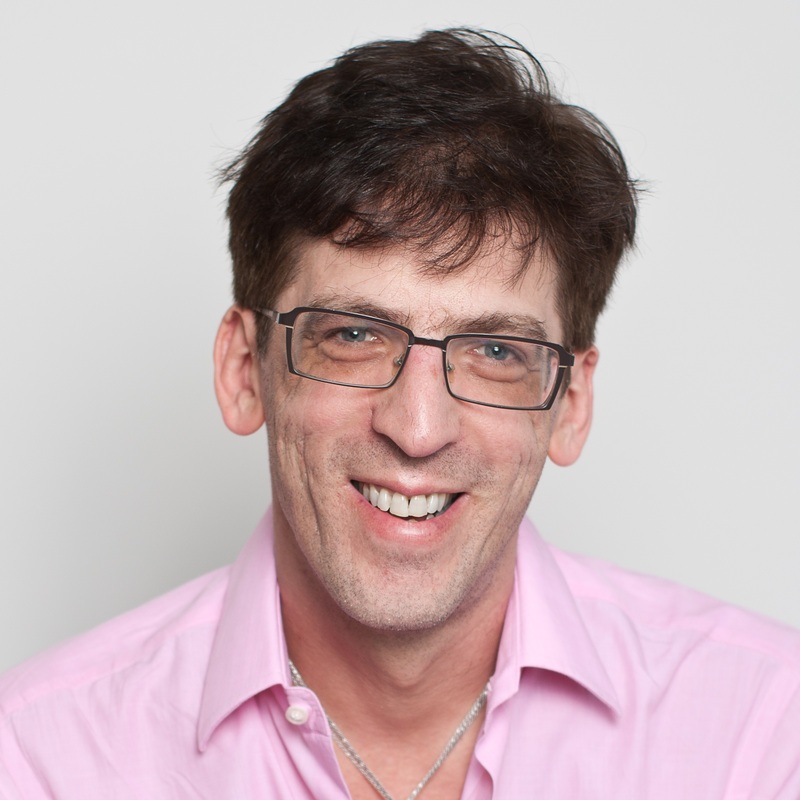 I have already explained that the choice you make determines if a query can be serviced by a single partition – which is preferred, and which should be the most common case – or if multiple partitions need to be looked at. And it also determines which items can be updated together in a single transaction, using a stored procedure – and which cannot. So with that in mind, let’s see what would make a good partition key for the different kinds of applications you might be building. Typical social networking applications store user profile data, and very often the user ID is a good partition key choice for this type of application. It means that you can query across all the posts of a given user, and Cosmos DB can service the query by looking at just the one partition where all of that user’s posts are stored. And, for example, you could write a stored procedure that updates the location property of multiple posts belonging to any user, and those updates would occur inside of a transaction – they would all commit, or they would all rollback, together. IoT applications deal with the so-called Internet of Things… where you’re storing telemetry data from all sorts of devices – it could be refrigerators, or automobiles – whatever. The device ID is typically used for IoT apps, so for example, if you’re storing information about different cars, you would go with the VIN number, the vehicle identification number that uniquely identifies each distinct automobile. Queries against any particular car, or device, can then be serviced by a single partition, and multiple items for the same car or device can then be updated together in a transaction by writing a stored procedure. In a multi-tenant architecture, you provide storage for different customers, or tenants. Each tenant needs to be isolated, so the tenant ID seems like a natural candidate to choose for the partition key. Because then each tenant can run their own queries against a single partition, and transactionally update their own data in that partition using a stored procedure, completely isolated from other tenants. You also need to think about how your application writes to the container, because you want to make sure that they get spread somewhat uniformly across all the partition within the container. Say you’re building a social networking app. I mentioned that user ID might be a good choice, but what about creation date? Well, creation date is a bad choice – for any type of application, really – because of the way the application is going to write data. That’s why user ID is a much better choice. Because then, writes get directed to different partitions, depending on the user. So throughout the day, as user profile data gets written to the container, those writes are being much more evenly distributed, with user ID as the partition key. And then you need to consider that, in some scenarios, you can’t settle on one good partition key for a single container. In these cases, you’ll create multiple containers in the database, each with different partition keys, and then store different data in each container, based on usage. We’re partitioning by tenant ID, but clearly tenant number 10 is much bigger than all the other tenants. That could be because all the other tenants are, let’s say, small mom-and-pop shops, while tenant number 10 is some huge Fortune 500 company like Toyota. Compared to tenant number 10, all the other tenants have modest storage and throughput requirements. This too creates a hot partition. First, look at storage. Partitions have a fixed size limit, which happens to be 10 gigabytes today, though that will likely change to 100 gigabytes in the future. But that limit is almost irrelevant, because independent of that, there is very uneven distribution of throughput. Tenant number 10 is much busier than the other tenants, so most writes are going to that one partition. And this is to the detriment of all the other tenants, because the reserved throughput is provisioned for the entire container. 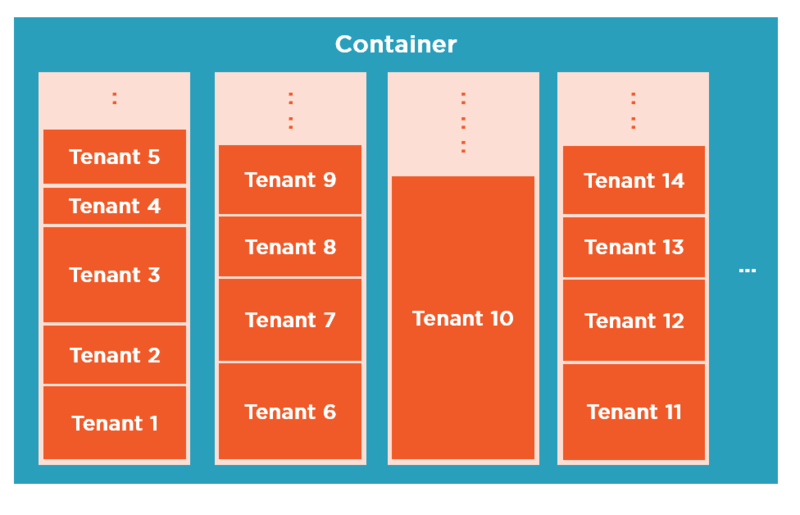 Furthermore, given the significantly larger volume of data for tenant number 10, it’s likely that large tenant will benefit from partitioning on some fine-grained property within their own data, and not just on the entire tenant ID, which is the partition key for the container. As a result, we have good uniformity across the entire database. One container handles small-sized tenants. 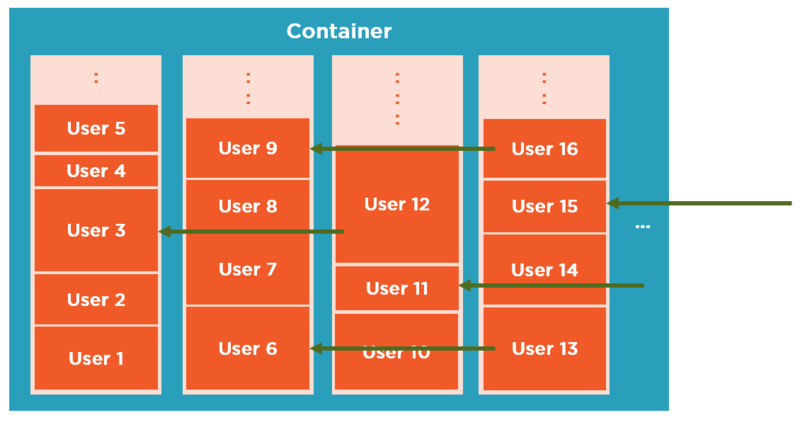 This container is partitioned by tenant ID, and might be provisioned for relatively low throughput that gets shared by all the tenants in the container. And the other individual container handles the large tenant, Toyota. This container is partitioned by VIN number, and might even reserve more throughput for all of Toyota than the first container reserves for all smaller clients combined.